It would be great to be able to have more control over the way in which compilations of notes are exported. A great example is the way in which Scrivener for mac allows you to customize every aspect of the complied file. What are some of the main options you would like to see that Citavi is lacking? We'd be glad to add these options to our development wish list. There are more detailed options, but for the moment these are the major ones I can think about. Thanks for the additional clarification on this! I've add these customization features to our wish list as well. is mentioned : "If you want the headings to be applied to categories at a lower level, you can do so. 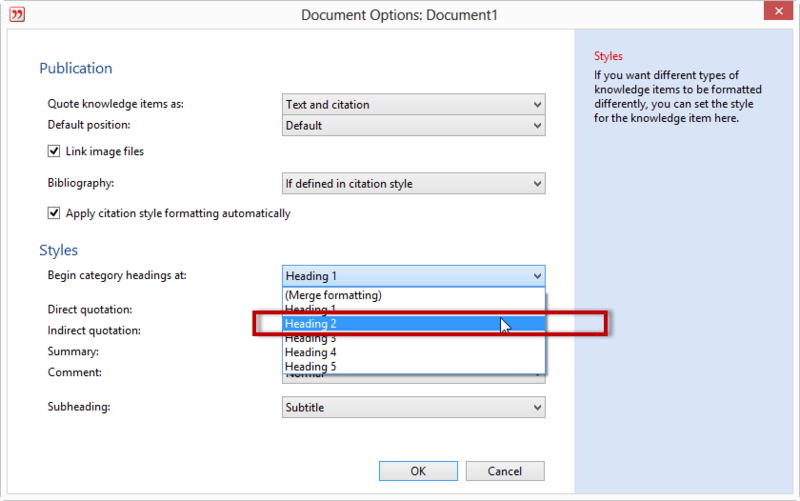 This is useful if you used the first category level in Citavi to separate different publications from one another." I interested in this option exactly for the mean that manual mentioned i.e. having more than one publication in one project. But this option seems not work. and the first level of category can not be lower than heading 1. And so we can not use this good option and must select "Merged Format". please correct it so the first category can be e.g. "title" or the second level of category can be heading1. Please just let us know if it doesn't work for you!